Remember the "friggin' awesome" smartphone that NextBit promised to unveil on September 1? Well, today is the day when we can see the handset and find out more about it. Called NextBit Robin, the new device is presented as "the only cloud-first smartphone", as it offers 32 GB of internal memory, plus 100 GB of free online storage space. The idea behind the NextBit Robin is that "the cloud is integrated right into Android OS." The phone offloads unused apps and content to the cloud, and restores them only when you need them again. Data backups are automatically made via Wi-Fi, but you can also set up backups via cellular networks. As you'll see in the images below, the NextBit Robin has an atypical design, and is based on Android Lollipop. NextBit doesn't say if Cyanogen is involved in any way in this project, despite the fact that, last year, the two companies announced that they'd collaborate to develop a "really cool" mobile product. You can already order the NextBit Robin via Kickstarter (check out the source link below). Early backers can buy the smartphone for $299 (limited to 1,000 units), and should get the device in January 2016. The retail price of the handset will be $399. Right now, the NextBit Robin is offered in only two color versions: mint and midnight. Perhaps an all-black version would have been a good idea, too. So, is anyone interested in being the Batman to this Robin? Aesthiscally this is the sexiest smartphone I've seen (ever) with such a mimalist design like this...heck I've never seen a finger print scanner like a dimple ever. Cooool! We will have to agree to disagree on the looks... just my opinion. But I believe the article said that the finger print scanner is in the power button on the right side, not the little dimple things at the top and bottom in the front. *This*. 32GB internal plus 100GB online. Why not just give the phone 128GB of memory to solve the storage issue? This is the most unpractical phone design I have ever seen in my life. Yes, it looks good but it's gonna feel extremely bad in hand with it's sharp corners. If you look closely at picture 7, the corners are rounded to avoid having sharp edges. 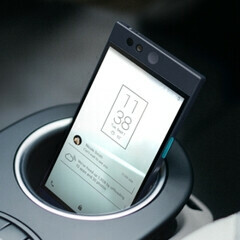 this phone looks like a a sony experia z with a girly rubber case. Girly? Hmmmm.... More like Fisher Price, IMO. After OnePlus One...I am not buying anything from startup company in near future! Not saying OnePlus One is bad...it's just OnePlus itself. I like the cloud logo on the back!! Crap cloud storage is Crap when your in an area where you will not get edge speeds. Or an area without any signal at all. I really like the minimal feel... although I'd rather see a 616 in it instead of an 808 as weird as that sounds.. next gen midrange as opposed to last gen...high? midrange? low flagship? what is the 808 anyway? 32GB + 100GB online? why not just 128GB + microSD slot? Creds to NextBit for making a phone that looks different. You can like it or not, but you can't argue that this doesn't look like anything out there. I personally love it!